Ever wish you could have a home where you wake up to sounds of birds singing, look out the window and watch the beautiful skyline frame tall mountains and tree lines, and your eyes sweep to ground level and there occasionally are deer, elk, wild turkey, and other wild animals. This home is well planned out for this country setting, along an old gavel road that long ago was used by the public to go from Regina to Gallina. 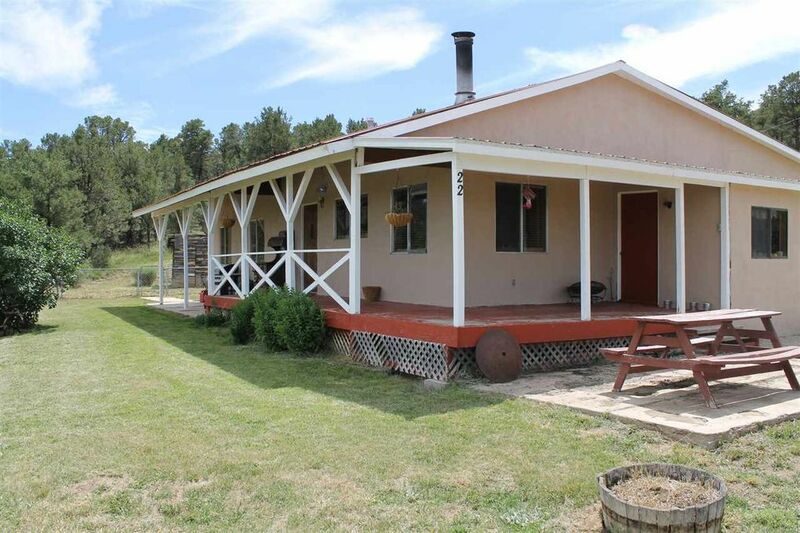 Easy access to the National Forest and on to the San Pedro Wilderness. If you like to hunt, hike, bird watch, or on your way to Abiquiu Lake, El Vado Lake, or Heron Lake this place is a good take off point. The Home has a deck on the east side to enjoy the views and the morning sunrise. The deck extend to the north, where the vistas to the north are great as you look over the valley and the high mountains. Use the foyer or enter into the dining room, where you can see the cook preparing meals. There is a large pantry so one does not have to leave this cozy home for weeks. The large living room is all set for game watching. The two baths are spacious, one has the laundry right behind it. The owner bedroom is quite large for some alone time if needed. The storage shed is 20 feet by 12 feet, large entry way and able to store tools and toys. The well-built carport, 31.5 feet by 24 feet deep has three bays. This home is nice, it is clean, is easily accessible, affordable, and it is your dream come true. You deserve it. Directions: From I25 at Bernalillo go north past Cuba and turn on to NM State Hwy 96, go to Regina, turn right on Old Gallina Road and home is on the right. From Abiquiu, turn on to NM State Hwy 96 at the junction to the Abiquiu Lake. Travel to Regina, and turn left on Old Gallina Road and home is on the right.